WE'RE ALSO DOING SOME GIFTING OF OUR OWN!!! 1 COMPLETE SET of EVERY COLOR WE STOCK!!! 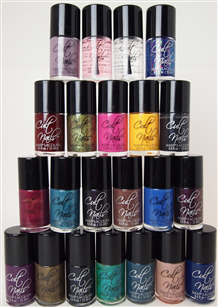 1 GIFT SET OF OUR GET IT ON / WICKED FAST COMBO, a POLISH, and a FILE! 1 CLAIRVOYANT NECKLACE (by Ginger Kitty Designs), a CULT NAILS T-SHIRT and 1 UNICORN PUKE!!!! EXAMPLE OF QR CODE! SCAN THIS WITH YOUR SMART PHONE!